Mizuho Information & Research Institute, Inc.
A consortium made up of Marubeni (project integrator), the University of Tokyo (technical advisor), Mitsubishi, Mitsubishi Heavy Industries, Japan Marine United, Mitsui Engineering & Shipbuilding, Nippon Steel & Sumitomo Metal Corporation, Hitachi, Furukawa Electric, Shimizu, and Mizuho Information & Research have been participating in an experimental offshore floating wind farm project sponsored by the Ministry of Economy, Trade and Industry since March 2012. At present, the laying of the extra-high voltage undersea cable and the dynamic cable at the testing area has been successfully completed. Setting one 2MW downwind-type floating wind turbine, the world's first 66kV floating power sub-station and the cables. Mooring operation has been successfully completed. Preparatory works for the operation are in process. 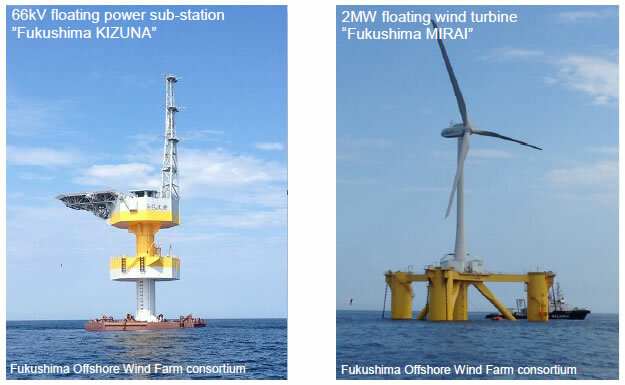 Connection of the extra-high voltage undersea cable and the dynamic cable has been successfully completed between onshore transmission line tower and 2MW downwind-type floating wind turbine through 66kV floating power sub-station. The following activities need to be completed to start operation of the power facilities. Expected commencement of operation of the power facilities is November 2013, but the schedule will be changed depending on the meteorological and sea conditions.